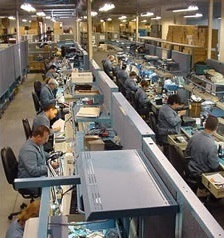 DBK’s Symbol repair center repairs and refurbishes most Symbol barcode scanners and also provides Symbol Depot repairs. Our Symbol repair service center is the best place to bring your Symbol equipment for maintenance. With over $1 million of parts in our inventory, we are prepared to fix your Symbol models, including the Symbol Motorola MC9060, the Symbol Motorola MC9090 and the Symbol Motorola MC3090. We have plenty of refurbished hardware available as well. Depending on the service contract you choose, the turnaround time for your repaired Symbol equipment is typically from as little as 24 hours up to 5 days. These contracts can be customized to your specific Symbol repair needs. Our Symbol Depot Repair Service includes 24/7 asset tracking online. Other repair services include rollout services, software flashing, configuration, equipment recovery and upgrades. We are proud of our unparalleled customer service, including live representatives to take your calls! Unlike many other repair service centers, all of our repairs come with warranties. We also offer consolidated billing and multiple types of standard service agreements that can be customized to your needs. DBK has over 22 years experience in the industry. Most of our customers are Fortune 1000 companies and have been with us for over 10 years, because DBK is easy to do business with! Give DBK a call to see how we can help you with your Symbol barcode scanners! Motorola MC9090, Motorola MC9060, Motorola MC23090, Motorola MC7090, Motorola VC5090, Motorola MC55, Motorola MC60, Symbol PDT6800, Symbol PDT6840, Symbol PDT6846, Symbol PDT3100, Symbol PDT3140, Symbol PDT6100, Symbol PDT6140, Symbol LS4005, Symbol LS4006, Symbol LS3200, Symbol LS2000, Symbol PPT8146, Symbol VRC 6900, Symbol PPT2800, Symbol PPT 2846 and many more models. We can help you, call today! Call or e-mail DBK for a quote today !